Few weeks ago, I broke my office tablet, and needed a replacement. (Chalked it all up to business expenses.) Then a few days later, when I brought my new computer to my outreach clinic, I was unable to log-in to that hospital’s operating system, as it did not recognize my new computer. I had to call IT for help to set it up, which in itself was a painful process. As the IT guy gave me step by step instructions over the phone to set up, he then gave me the password to type in, to gain access into the hospital system. The password was 25 characters long of random letters and numbers. 25 characters long, are you kidding me?! After carefully typing the 25 characters, it then prompted me to type the password again to confirm. That’s when I almost lost it! After regaining my composure, I was able to complete the task. Whoever decided on that very complicated password, made it more difficult to gain access to their system than to launch a nuclear warhead! In this information and technology age, we are inundiated with multiple different ID’s and passwords to remember, just to get by in our normal every day activities. Never in the history of man, did we have to use so many secret passwords, even if we are not spies nor secret agents. I know, identity theft is a real problem, but remembering (or not remembering?) a gazillion passwords can be quite distressing. 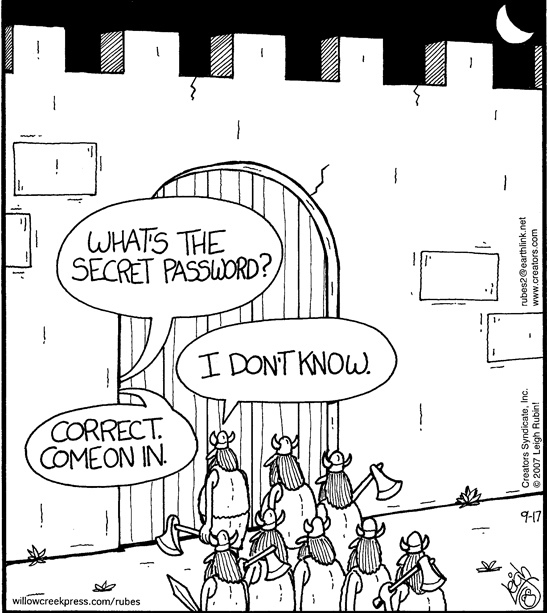 Having a secret password though, is not new, as it dates back in ancient times. I can picture in my mind a sentry during the Medieval times guarding a restricted passway: he will challenge anybody who wants to cross to give a password. Only those who can answer correctly can pass, and those who answer wrongly will be turned away or worse will be struck with a sword. When I go to our outpatient clinic, I have a user ID and password just to log-in to my computer. Then there is different one to sign-in into the electronic medical records. A seperate one for the PACS (Picture Archiving Communication System) to view the x-rays. And if I have to read and review sleep studies, that is another system that has a different user ID and password. Of course, there’s another set to open my office e-mail. (That’s why I don’t even check my office e-mail anymore.) I’m glad no password is required to use the restroom. When I make my rounds in the hospital, there’s an ID number and password to check the patients’ database and laboratory, a different one for the hospital PACS for x-rays, another one to complete and electronically sign medical records, and a separate one if I want to dictate my notes over the phone. And if I wanted to cool my heels or get a cup of tea at the doctor’s lounge, then that’s another ID and set of numbers I have to punch in at the door’s keypad to get in. Though I don’t mind remembering those numbers, since gaining entry means free snacks at the lounge. When I get home, and I have to check my personal e-mails, that’s another log-in ID and password. If I want to check my facebook account, or do on-line banking, or check on my credit card payments, or buy something from Amazon, or download music from i-tunes, or check something from e-bay, or book a flight on-line, or check the status of my Board certifications, or talk to my mother in Manila through Skype — those are all different ID’s and passwords. Of course I have to use a password to access my blogsite and write this grumpy article. I think I use about 20 different ID’s and password regularly everyday, and another 10 or 20 that I use not so frequently. All of these are clogging my brain. Sooner or later I will run out of memory space. And the worse part is, some of these systems ask you to change your password every so often, some seems almost every month! It is a good thing that if I forget my password, some systems will give me prompters or I can simply re-set it, and will not be smitten with a sword. Needless to say, there are the other important numbers that you have to remember, like you social security number, or home, office and cell phone numbers, your birthday (or you can forget about that! ), your kids’ birthdays, your spouse’ birthday, and your anniversary (or you will be rudely reminded!). With all these things that we are forced to remember, I’m lucky I can even remember my name. My real name that is, and not a user name, which I tend to forget most of the time. What’s the password? Just smite me!